Airway epithelial cells (AECs) are important in asthma as they are the first cells to encounter pathogens/allergens. In children, AECs can be obtained using a “blind” nonbronchoscopic technique through an endotracheal tube. However, due to the increasing use of laryngeal masks the number of children in whom this technique is applicable has become limited. Recently, the present authors began to use a portable “bronchoscope-directed” technique to sample AECs. The current study compares both techniques in both asthmatic and nonasthmatic children. A total of 81 children undergoing elective surgery, were grouped according to atopic status and respiratory symptoms. Cellular yield of blind and bronchoscope-directed brushings were compared and immunocytochemistry performed. AECs were cultured and cytokine analysis of culture supernatant undertaken. Both techniques were equally well-tolerated, with the only adverse effect being a cough in 10% of the subjects. The mean±sd cell yield was higher in bronchoscope-directed than blind brushings (5.1±2.4 versus 3.1±1.4x106 cells). Immunocytochemistry confirmed an epithelial cell lineage. Culture supernatant cytokine concentrations were similar regardless of sampling technique with patterns preserved between asthmatic and healthy nonatopic phenotypes. Compared with blind brushing portable bronchoscope-directed brushing is well-tolerated, yields significantly more cells and is a potentially quick and useful technique for obtaining airway epithelial cells for research into childhood respiratory disease, specifically asthma. Airway epithelial cells (AECs) serve a variety of functions. They act as both a physical barrier to both inhaled particulate matter and allergens and are the first line of defence for multiple viral and bacterial pathogens 1. Therefore, the study of these cells is vitally important in furthering current understanding of respiratory disorders, such as asthma and cystic fibrosis. In adults, AECs are often sampled bronchoscopically for clinical indications to aid the diagnosis of carcinoma of the lung 2 and in ventilator-associated pneumonia 3, 4. However, the study of these cells in children has, in the past, been limited by both access and availability. AECs can be obtained by performing bronchial biopsies but this bronchoscopic technique requires suitably trained personnel and is difficult to justify as a research tool in healthy children without respiratory disease 5, 6. The studies by Lane et al. 7 and Doherty et al. 8 describe a blind nonbronchoscopic technique for obtaining AECs for research purposes via an endotracheal tube (ETT) from children undergoing routine elective surgery. The present authors have successfully used this technique to examine biochemical and functional differences in AECs from children with and without asthma 9, 10, and inducible nitric oxide responses in young children and infants with CF 11. However, the increased use of laryngeal mask airways (LMA) in paediatric anaesthesia has significantly decreased the number of children in which this technique is now applicable. Consequently the current authors have adapted a bronchoscopic bronchial brushing technique to allow the sampling of AECs from small airways. The present study describes this safe and quick technique and compares the cellular, biochemical and culture properties of bronchial epithelial cell brushings obtained blindly via an ETT with bronchoscope-directed brushings, obtained through an LMA in asthmatic and nonasthmatic children. The study was approved by the Princess Margaret Hospital Human Ethics Committee (Perth, Western Australia) and involved the recruitment of children admitted to the hospital for routine elective surgery, predominantly for ear, nose and throat procedures, such as adeno-tonsillectomy or the insertion of grommets, following written informed consent from parents. Any children with underlying genetic or respiratory conditions (other than asthma) were excluded from the study. Sampling of AECs occurred soon after anaesthetic induction, with the method adopted being determined by the intubation technique utilised by the anaesthetist. If subjects were intubated through an ETT, a blind nonbronchoscopic brushing technique was used. Alternatively, if an LMA was employed, a bronchoscope-directed brushing technique was used. Both techniques were performed simultaneously in the anaesthetic room, prior to the elective surgery and added <5 min to the total anaesthetic time. Atopic status was determined using serum immunoglobulin (Ig)E and allergen-specific radioallergosorbent test (RAST; Pathwest, Perth, Western Australia) testing with atopy defined as a raised serum IgE and at least one positive allergen-specific RAST test to one of nine common allergens. Asthmatic status was initially physician diagnosed with documented wheeze in the preceding 12 months and validated with positive responses on both the International Study of Asthma and Allergies in Childhood and the American Thoracic Society respiratory questionnaires 12, 13. All the asthmatics recruited were mild and none were taking regular inhaled corticosteroids. Children were divided into the following groups: healthy nonatopic (HNA), healthy atopic (HA), asthmatic atopic (AA) or nonatopic asthmatic (NAA). Nonbronchoscopic bronchial brushing was performed using an unsheathed nylon cytology brush (BC 25105; Olympus, Welshpool, Western Australia) as described previously 7, 9. The brush was inserted directly through the ETT until resistance was felt and then rubbed gently against the epithelial surface. The brush was withdrawn and the tip cut off into 5 mL of collection media. The procedure was then repeated and all samples were transported back to the laboratory (Telethon Institute of Child Health Research, Subiaco, Western Australia), on ice, for processing. An unsheathed nylon cytology brush (BC 25105) was passed down the instrument port of a portable intubation bronchoscope (FI-13RBS; Pentax, Mountvale, NJ, USA) and kept “hidden” within the bronchoscope tip. The bronchoscope was then passed down the LMA and positioned at the lower edge of the vocal cords, which had been previously sprayed with lignocaine. Once the bronchoscope was below the vocal cords, the brush was pushed out of the bronchoscope and directed down the trachea until resistance was felt. After five to six gentle back and forth motions with the brush, it was brought back to just beyond the tip of the bronchoscope and both bronchoscope and brush brought out together. The brush was then pushed out of the bronchoscope and the brush tip cut off into 5 mL of collection media. The procedure was repeated and samples were transported back to the laboratory (Telethon Institute of Child Health Research), on ice, for processing. Epithelial cells obtained using both techniques were collected into RPMI-1640 (Invitrogen, Melbourne, Australia) containing 20% (volume/volume) heat inactivated foetal calf serum and processed immediately as described previously 7, 9. Alveolar macrophages were removed by incubation on a CD68-covered plate (Dako Australia, Botany, NSW, Australia) for 20 min prior to cell yield being assessed using a haemocytometer (BOECO, Hamburg, Germany). AECs were then divided for cell culture, protein and RNA extraction and cytospins. AECs were cultured by resuspending the cell pellet in supplemented bronchial epithelial basal media (LONZA, Walkersville, MD, USA) and seeding into pre-coated 25 cm2 culture vessels (Becton Dickinson, Franklin Lakes, NJ, USA) stored at 37°C in a humidified incubator 7, 9. Cultures were fed every second day and passaged every 13–16 days. Epithelial cells, cultured to p2, were cytospun onto glass slides, fixed in 4% paraformaldehyde, washed and then stained for the epithelial marker cytokeratin-19 (Dako Corp., Carpinteria, CA, US) as described previously 9. Cells were also stained for vimentin, CD1a, von Willebrand factor (Santa Cruz Biotechnology, Inc., Santa Cruz, CA, USA) and CD68 (Dako Corp.) to identify any mesenchymal cells, dendritic cells, endothelial cells or macrophages, respectively. Specific antibody staining was then visualised using a fluorescent microscope (Leica Microsystems Pty Ltd, Wetzlar, Germany). Cytokine concentrations in culture supernatants taken after 48 h incubation were measured using commercially available ELISA kits (supplier). Proteins measured included an anti-inflammatory cytokine, interleukin (IL)-6 (R&D Systems, Minneapolis, MN, USA), an inflammatory chemokine, IL-8 (BD Biosciences, San Diego, CA, USA) and a stimulator of epithelial cell growth, epidermal growth factor (EGF; Biosource, Camarillo, CA, USA). All results were tested for population normality and homogeneity of variance. Differences between groups were examined using the unpaired t-test or the Mann–Whitney rank-sum test depending on the distribution of the data. Table 1⇓ shows clinical characteristics of children sampled either through an ETT or a LMA based on phenotype. Both techniques were equally well tolerated with the only significant adverse event reported being a mild self-limiting cough post-operatively lasting <1 h and occurring in ∼10% of children brushed using either method. Overall, mean±sd epithelial cell yields were significantly higher in bronchoscope-directed than in blind nonbronchoscopic samples (p<0.001; fig 1⇓). Similar results were found when cell yields were compared between groups based on atopy or respiratory status (table 1⇑). Cell yields in bronchoscope-directed samples were significantly higher from HNA (p = 0.028) and HA (p = 0.007) children and a similar trend towards significance was observed in AA (p = 0.069) and NAA (p = 0.098) children. No differences in cell yields were detected between different phenotypes. Cellularity of samples collected blindly through an endotracheal tube technique (ETT) and bronchoscopically through a laryngeal mask airway (LMA). Horizontal lines indicate mean values. ***: p<0.001. Cell culture success rates using both techniques were similar, such that all cultures exhibited some growth, 88% grew to confluence and 100% of these survived to a third passage and beyond. No gross morphological differences were seen in established primary epithelial cultures between any of the phenotypes assessed or within cultures of each phenotype over successive passage (data not shown). Similar to previous studies on AECs obtained using the blind nonbronchoscopic technique 7, 9, immunostaining of cultured bronchoscopically derived cells at p2 confirmed an epithelial cell lineage (fig. 2⇓). Characterisation of established epithelial cell cultures. Cytospins, obtained after a bronchoscope-directed brushing taken from a representative healthy nonatopic child (passage 2), were incubated with primary antibodies specific for mesenchymal (vimentin; a–c), endothelial (von Willebrand factor; d and e), macrophage (CD68; f and g), dendritic (CD1a; h and i) and epithelial lineages (cytokeratin-19; j and k) for 24 h at 4°C followed by fluorescently conjugated secondary antibodies for a similar period. Similar to brushing via an endotracheal tube, cytospins only stained positive for cytokeratin-19. Cytokine production in the supernatants of HNA- and AA-AEC cultures were compared and found to be comparable in both “blind” and “bronchoscope-directed” samples. Patterns of EGF, IL-8 and IL-6 production were preserved between phenotypes regardless of sampling technique (fig. 3⇓). 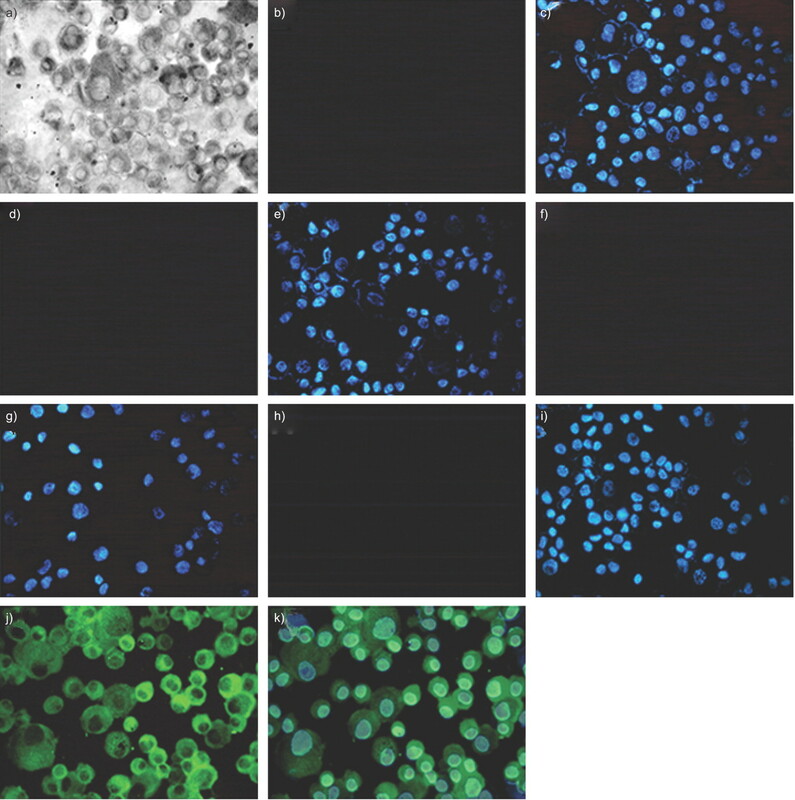 Biochemical analysis of supernatants from established airway epithelial cell cultures. a) Interleukin (IL)-6, b) IL-8 and c) epidermal growth factor found in subjects undergoing the endotracheal tube technique (ETT) or the laryngeal mask airways (LMA) technique. HNA: healthy nonatopic: AA; asthmatic atopic. #: p = 0.86; ¶: p = 1.0; +: p = 0.844; §: p = 0.62; ƒ: p = 0.797; ##: p = 0.971. In the current study, a novel bronchoscope-directed brushing technique for obtaining primary epithelial cells from children with varied respiratory and atopic status has been compared with a blind nonbronchoscopic technique previously described by Lane et al 7. 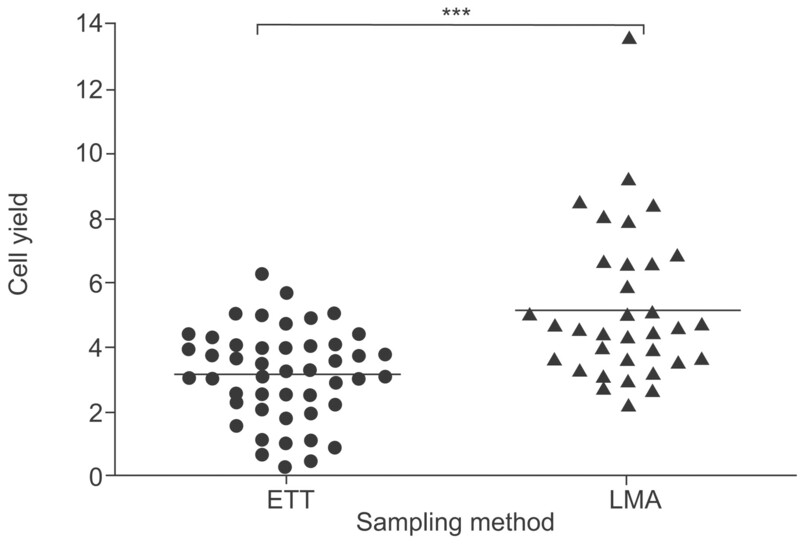 The present authors have shown that bronchoscope-directed sampling through an LMA significantly increases epithelial cell yield by ∼60% when compared with blind sampling through an ETT. The cells obtained using both techniques exhibit similar epithelial lineage profiles. These AECs show a similar propensity to propagate in culture. Furthermore, endogenously produced cytokine production is similar using both techniques and varies depending on disease phenotype, as has been shown previously 9. The need to develop a new technique to sample AECs stemmed from the increased use of laryngeal masks by paediatric anaesthetists thereby preventing blind brushing being employed as a sampling technique. A modified technique was needed that did not impact unduly on the surgical procedure. Importantly, the bronchoscope-directed technique is still performed in the anaesthetic room prior to elective surgery. The vocal cords are sprayed with lignocaine either by the anaesthetist prior to inserting and securing the LMA or by the bronchoscopist, once the LMA is in place. The use of a portable intubating bronchoscope negates the need for a stack system, which would otherwise clutter the anaesthetic room. The 4.1-mm bronchoscope used can be passed through a straight size 2 LMA (in a 10–20 Kg child) and so this technique is potentially suitable for children as young as 12 months of age, although the youngest child recruited for bronchoscopic sampling in current study was 2.5 yrs of age. So as not to prolong anaesthetic time the bronchoscope is positioned at the lower edge of the vocal cords with the brush directed from there down the trachea, rather than under direct vision further down the respiratory tract. Both techniques were performed by medically qualified personnel trained in paediatric bronchoscopy. The present study reconfirmed that both epithelial cell sampling techniques are safe and well-tolerated by patients 7, 14. Half of the children recruited for the study were followed up 2 weeks after surgery with a telephone questionnaire. The only side-effect mentioned by parents was that of a cough, which occurred in 10% of patients regardless of sampling technique. The current authors have previously shown that 20% of children have a short-lived cough following blind bronchial brushing 7. The present authors believe that the decreased incidence of cough in this study may have been because bronchoalveolar lavage was not performed simultaneously as it had been in the previous study. An important point to note is that the cell yield using either of the methods described above is significantly higher than that in any other study. A high cell yield enables more extensive downstream analysis to be undertaken. Thus, 4×106 AECs allows for cell culture as well as protein and RNA extraction to be performed, in addition to cytospins for immuocytochemistry to be produced. The majority of adult studies using bronchoscopic techniques report cellular yields of ∼105 cells 14, 15. Similarly, Doherty et al. 8, using a blind technique in children, showed a median cellular yield using two brushes of ∼5×105 cells. Most other studies use a protected-specimen brush to ensure the bronchial nature of the sample and to prevent cellular or bacterial contamination on brush insertion/withdrawal. However, the current authors believe that by withdrawing the brush into the sheath a significant number of cells are lost. By performing nasal brushings using sheathed and unsheathed brushes in different nostrils in healthy adults, the present authors show that cell yields are ∼75% higher when no brush sheath is used (unpublished data). Similarly, experience has shown that pulling a cytology brush back through a 4.1-mm bronchoscope port, which is similar in size to a brush sheath, results in the loss of significant numbers of AECs. There are a number of potential reasons why cellular yield is greater when AECs are sampled bronchoscopically. One is that for a similar sized child, an LMA has a larger internal diameter than an ETT, thus making losing cells on brush withdrawal less likely. Also, positioning the brush just distal to the tip of the bronchoscope probably shields the sample when both brush and bronchoscope are withdrawn together. Finally, and possibly most importantly, being closer to the site of sampling allows for greater freedom and manoeuvrability of the brush thereby allowing for a better quality sample to be taken. IL-6, IL-8 and EGF production in the supernatants of HNA- and AA-AEC cultures were comparable in both blind and bronchoscope-directed samples, with patterns of production preserved between phenotypes. These results confirm previous findings 9 and support the assertion that AECs sampled using both techniques are essentially the same. To conclude, the present results indicate that bronchoscopic brushing in children is a safe, quick and potentially valuable additional technique for obtaining bronchial epithelial cells from children with and without respiratory disease in institutions where laryngeal mask airways are commonly used. This study was supported by the National Health and Medical Research Council (Canberra, Australia; grant number 303145) the Asthma Foundation of Western Australia (West Perth, Australia) and the Child Health Research Foundation (Perth, Australia). P.S. McNamara is a Wellcome Trust Clinical Fellow. The authors would like to thank D. Mullane (Dept of Respiratory Medicine, Princess Margaret Hospital for Children, Perth, Western Australia), A. Fonceca and A. Mladinovic (both Dept of Respiratory Medicine, Princess Margaret Hospital for Children, and Telethon Institute for Child Health Research, Subiaco, Western Australia) for providing technical assistance and D. Knight (James Hogg iCAPTURE Centre for Cardiovascular and Pulmonary Research, St Paul's Hospital, and Dept of Anesthesiology, Pharmacology and Therapeutics, University of British Columbia, Vancouver, BC, Canada) for critical appraisal of the current work prior to publication. Knight DA, Holgate ST. The airway epithelium: structural and functional properties in health and disease. Respirology 2003;8:432–446. Pedersen U, Balle VH, Greisen O. Diagnostic value of brush biopsy in suspected bronchial carcinoma with the use of the flexible fibre bronchoscope. Clin Otolaryngol Allied Sci 1981;6:329–333. de Jaeger A, Litalien C, Lacroix J, Guertin MC, Infante-Rivard C. Protected specimen brush or bronchoalveolar lavage to diagnose bacterial nosocomial pneumonia in ventilated adults: a meta-analysis. Crit Care Med 1999;27:2548–2560. Baughman RP. Protected-specimen brush technique in the diagnosis of ventilator-associated pneumonia. Chest 2000; 117 : Suppl. 2 203S–206S. Regamey N, Hilliard TN, Saglani S, et al. Quality, size, and composition of pediatric endobronchial biopsies in cystic fibrosis. Chest 2007;131:1710–1717. Payne D, McKenzie SA, Stacey S, Misra D, Haxby E, Bush A. Safety and ethics of bronchoscopy and endobronchial biopsy in difficult asthma. Arch Dis Child 2001;84:423–426. Doherty GM, Christie SN, Skibinski G, et al. Non-bronchoscopic sampling and culture of bronchial epithelial cells in children. Clin Exp Allergy 2003;33:1221–1225. Kicic A, Sutanto EN, Stevens PT, Knight DA, Stick SM. Intrinsic biochemical and functional differences in bronchial epithelial cells of children with asthma. Am J Respir Crit Care Med 2006;174:1110–1118. Lane C, Knight D, Burgess S, et al. Epithelial inducible nitric oxide synthase activity is the major determinant of nitric oxide concentration in exhaled breath. Thorax 2004;59:757–760. Moeller A, Horak F Jr, Lane C, et al. Inducible NO synthase expression is low in airway epithelium from young children with cystic fibrosis. Thorax 2006;61:514–520. Romagnoli M, Vachier I, Vignola AM, Godard P, Bousquet J, Chanez P. Safety and cellular assessment of bronchial brushing in airway diseases. Respir Med 1999;93:461–466. Hanson FN, Wesselius LJ. Effect of bronchial brush size on cell recovery. Am Rev Respir Dis 1987;136:1450–1452.